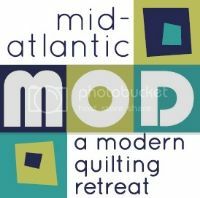 Philadelphia Modern Quilt Guild: Spotlight on... Amanda! Take a break from all your projects to drool over all the lovely photos and learn more about Amanda! My name is Amanda Colyer, and I live in Phoenixville, PA with my husband and our lovable mangy mutt. I'm 26, and I've been sewing since I was in grade school. By day, I'm a traveling sales representative for a division of a global company. By night, I'm a quilter, knitter, and sewer. When I'm not doing something crafty, I'm playing video games (poorly) with my husband. • How did you get started quilting? My mother was the person who got me started quilting -- I had always wanted to do it but was intimidated by all of the precise cutting. For my birthday several years ago, she gave me a sample quilt kit she had put together, completely cut out. I had no more excuses to put off quilting. Embarrassingly, I hit a road block after piecing the top. I couldn't figure out how to actually quilt it! I got back into quilting a few years later once I figured out how to free motion quilt, and completing this one has been on my 'to-do' list ever since. • Who taught you to quilt? I learned to sew from my mother, and now we go back and forth teaching each other new techniques. I recently taught her how to free motion quilt. • Did you ever take quilting lessons from someone? No formal classes, no. I did teach a class at Spool in Philadelphia last year. • What do you like best about quilting? My favorite thing about quilting is that it appeals to both my crafty side and my analytical side. Measurements and angles meeting color and form is the best of both worlds to me. • What is the hardest thing about quilting? The hardest thing about quilting (and my least favorite) is still all the preliminary cutting that needs to be done... though clear rulers, rotary cutters and self-healing mats make it a much more painless process. • How do you decide what pattern to make? Usually I start with a color scheme in mind, pick fabric, and then decide on a pattern from there. I hardly ever start with a pattern. • Where do you do your work? Do you have a quilting room? I am lucky enough to have a whole room dedicated to my various crafty endeavors. • Do you use a sewing machine, long arm quilter or do you quilt by hand? The first quilt I ever finished was quilted by hand. It was a queen sized monster, and I swore I'd never do it again. Now I do all of my quilts on my home sewing machine, from baby quilts to queen bedspreads. Just a basic run of the mill Kenmore. My preferred method of quilting is free motion. I just find that it looks good with every pattern. • How much time do you quilt during an average week? In a good week, I try to quilt a little every day after work. I find it very effective in melting away the stresses of the day. If I'm really lucky, I have the time on the weekend to sit down and quilt for a few solid hours. • Do you name your quilts or label them? I don't usually name quilts -- I'm not terribly creative in that way. Usually they get assigned a name only when I upload them to flickr! I do however always try to label my quilts, and I like incorporating hand embroidery in each label. • How do you choose your colors? What are your favorites? I'm a fan of bright, saturated colors, and I almost always use plain white sashing. I love the crisp, clean look that white sashing gives quilts. My favorite color combination is green, blue, and brown. • Where do you buy your fabrics and materials? Is there any particular supply you’re partial to? Most of my fabric is purchased online. I watch for sales (particularly at Fabric.com and Etsy) like a hawk! I have a fairly large stash, but there's always room for more. • What quilt(s) are you working on now? Right now, I'm making a lap quilt version of the cover quilt from 'Modern Log Cabin Quilting', using scraps of my favorite fabric line (Denyse Schmidt's 'Hope Valley') from a king quilt that I completed recently. • Do you make up your designs? I use a pattern about half the time, and make up my own designs about half the time. Once I've found a block that I like, I like to play with size and scale to make the perfect layout. • What other crafts do you indulge in or hope to learn? I am very passionate about knitting. This is another skill passed on to me by my mother. Plus it's a lot easier to drag around a sleeve than a whole quilt to work on while I'm traveling! I also design & sew purses and pillows, and crochet occasionally as well. • What are your quilting related goals? My goal is simple: find more time to spend quilting. • What do you consider your greatest quilting related achievement? My greatest quilting related achievement was completing my first spiderweb quilt. It was much more time consuming (and fabric consuming) than I had originally anticipated. After all the work that went into it, this quilt is my most prized possession. If our house was burning down, I'd grab three things: my husband, our dog, and this quilt! Haaha! Thanks so much for answering all the questions, Amanda! Hope everyone enjoyed learning more about a fellow member. Thanks, Nicole! Very strange and very cool to see a post about oneself on the 'net. You always do a great job with the spotlights. Thanks for your hard work! Thanks thanks!! It's all thanks to you guys - all the volunteers who answer all my questions! LOVE all the photos and loved learning more about you, Amanda.